SterJo Portable Firewall PRO is device designed to prevent outsiders from accessing your network even if it is run from a USB drive. The unit serves as the single entry point to your network and evaluate all TCP connections requests as they are received comparing them with each rule in the policy. 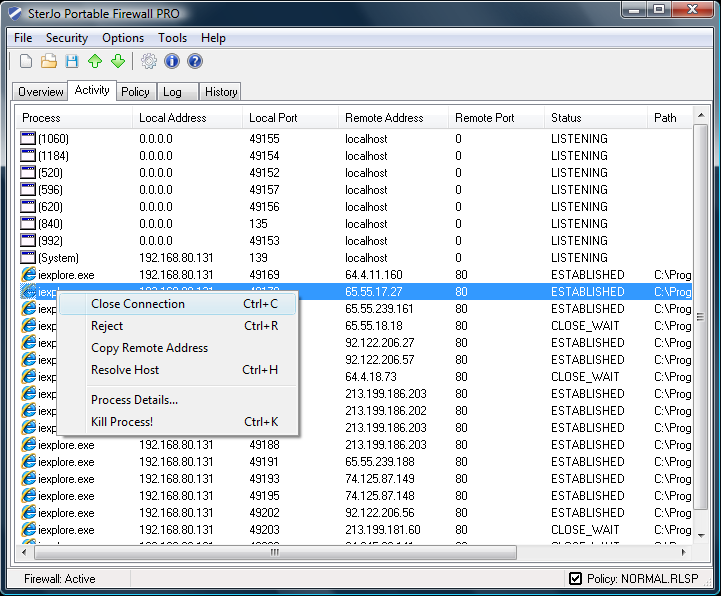 SterJo Portable Firewall PRO is advanced easy-to-use software with ability to watch for all ports on your system and block them if necessary. Device designed to prevent outsiders from accessing your network. * Activity provides a real-time view of the open connections through the firewall. * The policy editor is used to define a security policy where connections requests from unauthorized ip addresses and ports are rejected. * Log provides data connection notes that can be used for prosecuting the potential attackers. * History tab gives you information about the traffic and blocked attempts. Qweas is providing links to SterJo Portable Firewall PRO 3.0 as a courtesy, and makes no representations regarding SterJo Portable Firewall PRO or any other applications or any information related thereto. Any questions, complaints or claims regarding this application SterJo Portable Firewall PRO 3.0 must be directed to the appropriate software vendor. You may click the publisher link of SterJo Portable Firewall PRO on the top of this page to get more details about the vendor.